A single hair consists of a hair shaft (the part that shows), a root below the skin, and a follicle, from which the hair root grows. Hair is made of a type of protein called keratin. Most people lose about 50 to 100 head hairs a day. These hairs are replaced — they grow back in the same follicle on your head. This amount of hair loss is totally normal and no cause for worry. If you're losing more than that, though, something might be wrong. Skin disorders: Some disorders of the skin, for example psoriasis, tinea infection, lichen planus on scalp may cause hair loss. Aging: Hair loss increases likelihood increases with age. By 35, 40% of men have noticeable hair loss, while by 60 65% do. Also elderly hair tends to be more thin and fine giving more of an appearance of hair loss. Hormonal: Since hormones both stimulate hair growth and cause hair loss, hormonal changes by far have the biggest impact on hair loss. These can affect both men and women. Men generally have hair loss concentrated in a specific pattern from the front through to the crown. Women tend to have thinning throughout their head without being in any specific pattern. This type of hair loss is caused by the androgen DHT, or Dihydrotestosterone. Since everyone has DHT that is produced by their bodies and only some people suffer from hair loss there has to be another factor involved. This other factor is having follicles that have a greater number of Androgen receptors for the DHT to attach to. This is the component that is inherited through the genes. Treatment of alopecia or hair loss is directly related to its cause. A healthy hair follicle can produce a healthy hair. So in regards to treatment of hair loss or alopecia the treatment which treats the causative ailments can give a long standing and established result. A proper homeopathy treatment can be proved most beneficial for the treatment of any type of hair loss as homeopathy treats the root cause of any health disorders. Hair loss due to any mental and physical stress can be well treated by proper homeopathy treatment as homeopathy medicines gives good impact on psychological and spiritual level thus helps to maintain a healthy mental condition and indirectly regulate to maintain a healthy balance of stress hormones in our body. Over secretion of stress hormones can put bad impact over the hair follicles. Many drugs like anti cancer drugs (chemo therapy) and so many other drugs have strong side effects on the body including hair follicles. So they destroy the healthy atmosphere of the hair follicles and cause the immature massive hair loss. A proper homeopathy treatment can neutralize the toxic effects of those strong chemical drugs and also helps to accelerate the body’s auto detoxification process thus can be proved beneficial to check such type of drug induced hair loss. The homeopathy treatment not only checks the hair loss ailments but also treats the person as a whole so make the person healthy as well. Many health disorders likes tinea infection on scalp, lichen planus of scalp, psoriasis can causes hair loss. A proper homeopathy treatment can cure such diseases permanently and as well helps to treat the hair fall effectively. The important point in homeopathy treatment that it treats the person as a whole so make the person healthy not only to any specific body part but to the whole person and more over without giving any drug side effects. Some women after child birth or during approach of menopause experiences of massive hair fall result from hormonal changes. Any hormonal treatment in those cases will not give the satisfactory results to check the hair loss. But well selected homeopathy medicines in this case not only are able to check the hair loss problem but also be helpful to cure all other associated problems as well. In addition to a good homeopathy treatment a healthy nutrition habit is also highly required for a healthy hair and hair follicle. A low protein and iron deficient diet can make your hair weak and thin. So a well balanced natural diet is strongly advisable for healthy hairs. Hair fall due to hormonal disorder or stress related condition have a promising cure rate by our advanced homeopathic treatment package. It is because our treatment maintains the body’s normal hormonal level as well as stress hormone too. Hair fall from all over the scalp showing the scalp skin in some places have a high percentage of cure rate by our advanced homeopathic treatment package. The thinning of hair related to protein deficiencies or some micronutrient deficiencies either by inadequate supply or improper absorption of nutrients that causes the thinning of hair shaft and breakage. Our advanced homeopathic treatment package cures the root cause health condition and thus helps in preventing the hair loss problem. Hair fall associated with dandruff and any tinea infection has a very high success of cure rate with our advanced homeopathic treatment package which not only cures the hair loss problem but also cure the associated health problems as well. Because our treatment treats the patient as a whole. Hair fall due to different drug’s side effects like after chemo therapy, oral contraceptive, ace inhibitor, beta blocker, antithyroid drugs, anti seizure drugs, anti coagulant drugs responds very well to our treatment kit and have a 100% of cure rate. Our advanced Homeopathic treatment package accelerates the body’s auto detoxification process as well as neutralizes the toxic effects of those drugs on hair follicle and thus gives a good result to cure the problem. Hair loss due to hair pulling and twisting, first the cause should be avoided and use of our advanced homeopathy treatment can offer a very good result. In lipedematous alopecia the subcutaneous fatty layer get thickened and hair loss occurred. With our advanced homeopathic treatment package the proliferation of the fatty layer is checked up and can be completely cured and thus cures hair loss from that origin. The Hair shaft abnormalities like thin and broken hair results from node-like swellings on the hair shaft called trichorrhexis nodosa where the shaft readily fractures from that point is very well curable by our advanced homeopathic treatment which helps to regain back the hair texture by treating the cause of hair fragility and has a high percentage of cure rate. Follicular hyperkeratosis is characterized by excessive development of keratin in hair follicles, resulting in rough, cone-shaped, elevated papules whose openings are often closed with a white plug of sebum. It can be caused by vitamin A deficiency or chronic exposure to arsenic. 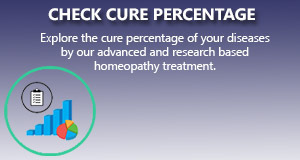 With our advanced homeopathic treatment it can be corrected permanently before scarring developed. With addition to that a balanced nutritional habit of natural fruits and green leafy vegetables will be very helpful So here the percentage of cure is maximum in beginning stage before scarring occurred. Hair loss related to follicular lichen plannus also known as lichen planopilaris, results in tiny red spiny papules around a cluster of hairs have a very good cure percentage by our advanced homeopathic treatment package. Hair fall related to auto immune disorders have a moderate success rate by our homeopathic treatment package. In congenital hair loss the homeopathy treatment will not give expected result. The cure percentage is minimal.